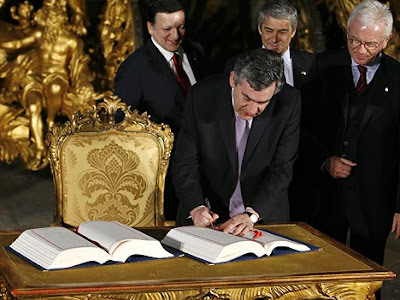 Yesterday, Gordon Brown missed the official signing of the EU Treaty officially because of a "diary clash", but more likely because he didn't want to be seen by the British public to be signing away our veto on European matters. Unfortunately instead of being snapped alongside his EU counterparts, he was caught on camera signing over powers to Brussels in a room by himself later on. The Government has tried to downplay the significance of the EU Treaty but as I have highlighted before on this blog, it is quite clearly the Constitution in all but name. The Prime Minister has refused thus far to allow British people to have a referendum on the Treaty - probably because he knows he'll lose it. You can join the cross-party campaign for a referendum by signing the petition HERE. The European Project needs a constitution; much of its terms are sensible and move the European project onwards. That Gordon Brown chose to sidle in by himself to endorse the treaty demonstrates poverty of political leadership, however, the Tories continue to be disingenuous about Europe - why don't you campaign to come out of the EC altogether? After all, isn't that what you really want to do? I think I now know how he felt! If we cannot get the promised Referendum, we might indeed -- after the next General Election (whose outcome now seems almost certain) -- have to seriously consider offering the people of this country the option to pull out. However I wouldn't put that on the table unless it becomes necessary. We might just get our Referendum in the end, and we can then see where that takes us in terms of options. One thing is certain: this country must not hand over its sovereignty without the formal approval of its people: no national Government has ever been elected with the authority to do so.